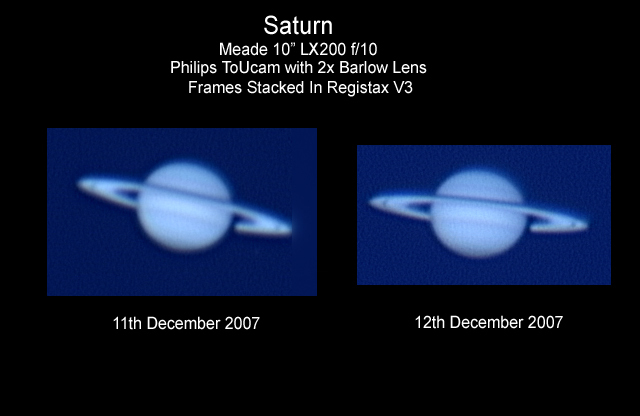 Barry Ashforth captured the following images of Saturn in December 2007. Saturn 5-7 minutes after re-appearance with a 2x Barlow lens. 200 frames. The large crater to the lower left of the picture which is almost in darkness is Theophilus. 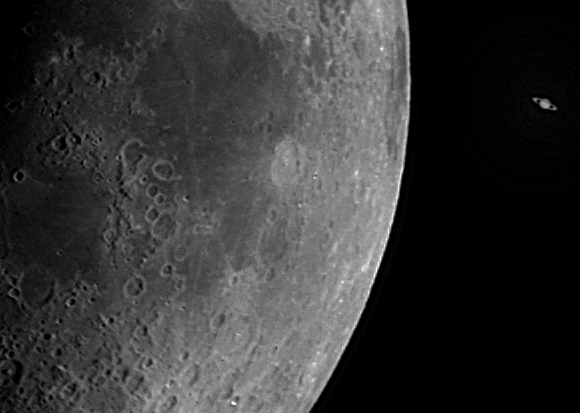 Mare Crisium is at the top centre with Mare Fecunditatis below it. The crater Langrenus is on the right of the Mare Fecunditatis. Saturn 10 minutes after re-appearance with a 2x Barlow lens. 100 frames. Saturn 15 minutes after re-appearance, no Barlow lens. 100 frames. 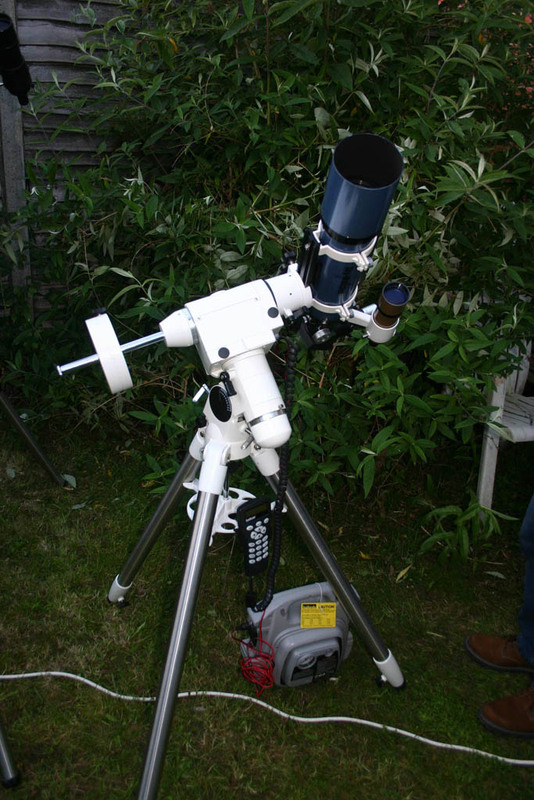 Adrian Brown's ED80 refractor on an HEQ5 Pro mount. 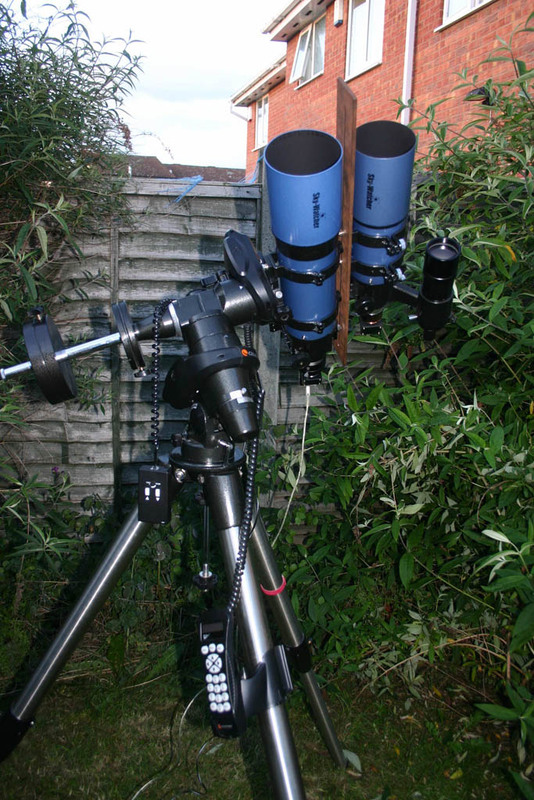 Chris Newsome's Skywatcher 102T and piggybacked 80T telescopes on a Celestron CG-5GT mount. 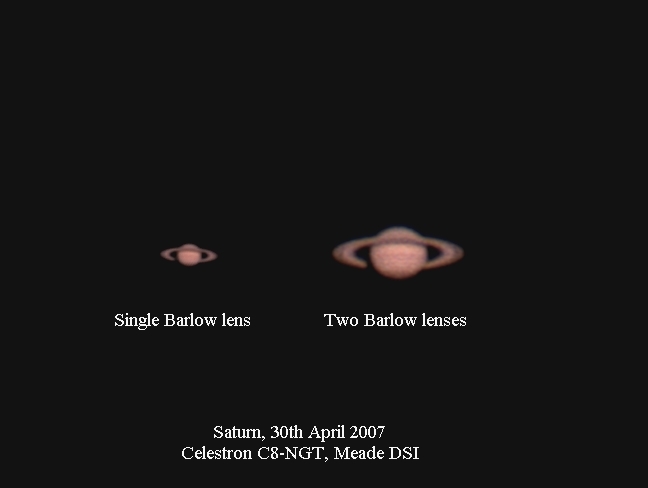 Chris Newsome captured this pair of Saturn images on the 30th April 2007 using a Celestron C8-NGT/Moonlite CR-1 and a Meade DSI, one with a single Barlow lens and the other with two Barlow lenses. Stacking was performed in Registax v4 and processing in CS2. 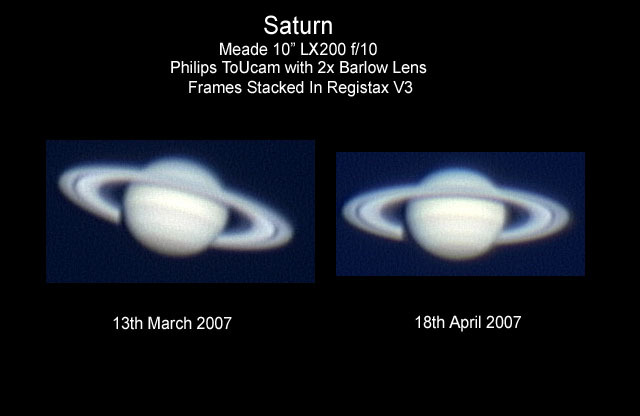 Barry Ashforth captured the following images of Saturn in March and April 2007. 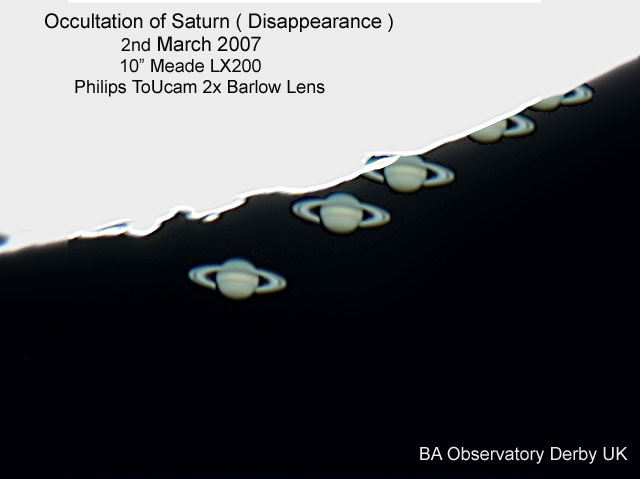 This image of Saturn was captured by Simon Allcock on the 15th April 2007 using a Meade LX90, a 2x Barlow lens and an LPI camera. 47 frames were stacked in K3CCDTools3 and processed in CS2. Chris Newsome assisted in processing the images. 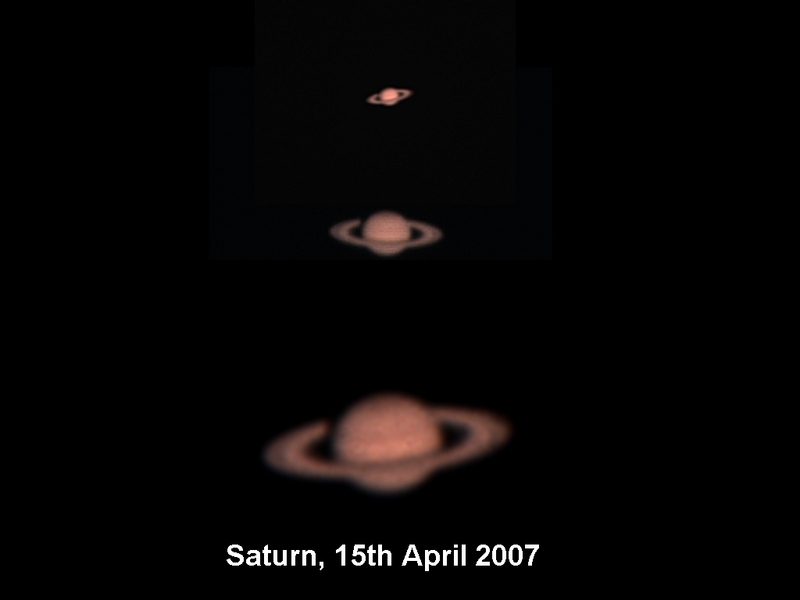 The following montage of three Saturn images was taken by Chris Newsome on the 15th April 2007. The images were captured with a Meade DSI camera through Simon Allcock's 8" Meade LX90 and using a combination of magnifications. Top - 255 frames, no Barlow, Middle - 49 frames, 2x Barlow, Bottom - 10 frames - 2x Barlow + 2x Barlow (yes really). Chris comments: "The atmosphere was fairly hazy and the use of two Barlow lenses was pushing it a bit (hence the poor quality of the image)!" All the images were stacked in Registax version 4 and processed in CS2. 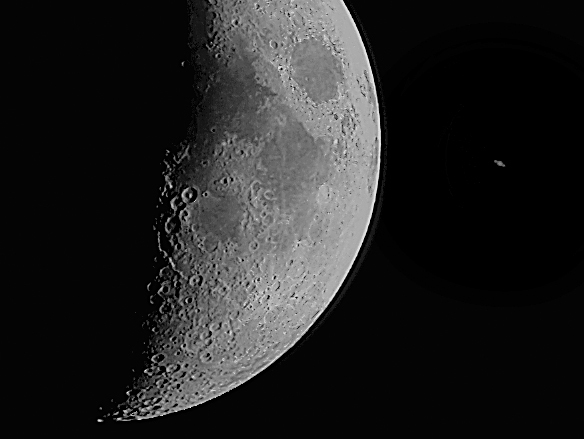 The following image of the graze occultation of Saturn by the Moon on the 2nd March 2007 was captured by Mike Dumelow. He used an 8-inch Dobsonian telescope to which he attached a Sony video camera using afocal (eyepiece) projection. The images were recorded and displayed on a TV monitor from which Mike photographed this frame using a 35mm film camera. The negative was then scanned by Mike Lancaster using an Epson V700 photo scanner and SilverFast software into Adobe Photoshop Elements where the image was slightly enhanced and some noise removed. 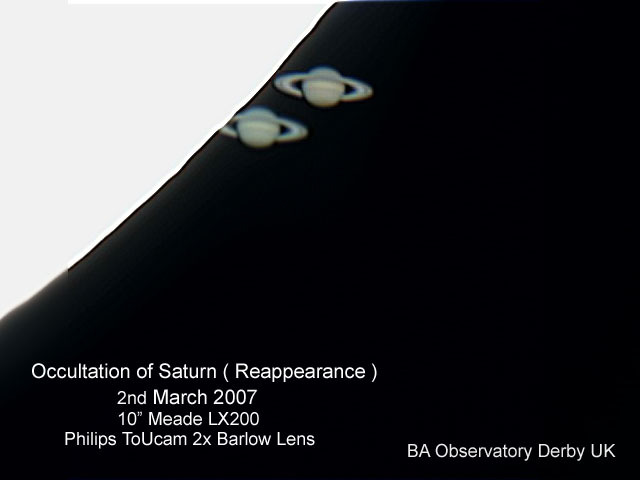 Barry Ashforth captured the following composite images of the disappearance and the reappearance of Saturn from behind the limb of the Moon during the graze occultation on the 2nd March 2007. 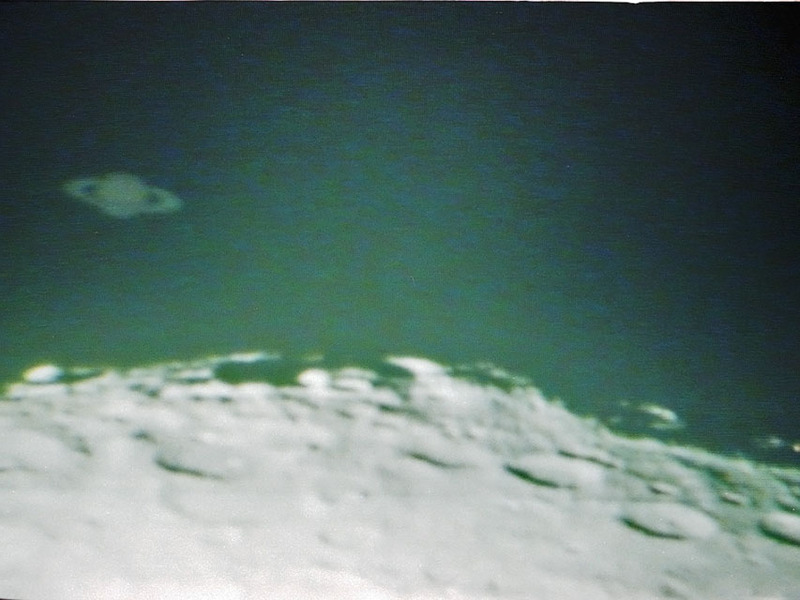 The camera was exposed to show Saturn hence the Moon is very over-exposed. The graze path was around 30 miles wide and ran from North West England through to the South Coast, narrowly missing Derby but fortunately passing right over my mum's back garden in Basingstoke. So I travelled south with the Celestron C8-NGT, Meade DSI, Laptop etc. and hoped that the weather would hold up. I was not to be disappointed. Well, it's rare that the UK has a clear night to observe an event. And the event, itself, was even rarer than the UK having a clear night! 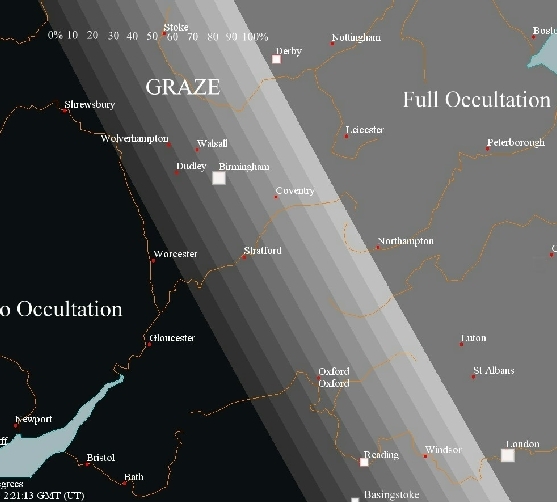 The graze itself happened around 02:47 from Basingstoke, although there was a full occultation from Derby around the same time. The scope was setup, battery plugged in and then it transpired that the power level wasn't up to full strength and the mount was struggling to slew. So I had to man handle the scope into position and hope there was enough power in the pack to track the planet - there was! I set the scope up around 9pm and left it tracking doing minor manual corrections to the drift alignment to keep the planet in the field of view (FOV) of the DSI for the longest possible time (I managed, by the time of the graze, to have the planet in the FOV for about 1.5 hours). At around 01:50, both the Moon and Saturn were in the same FOV and I could try some quick test exposures to try and achieve a balance between the brightness of the near full Moon and the relative dimness of Saturn. It proved a very difficult thing to do and to keep just a hint of the planet meant the Moon was overexposed. At around 02:15am I hit the start button on the computer to start recording the whole passing of the moon in front of Saturn and left it running for around an hour. Each exposure was in the region of 0.003 of a second and in total, I recorded just over 5000 frames over the period (the download of the image to the computer and the saving on the computer took considerably longer than the exposure itself). Each image was about 1 MB and in total I used 5 GB of disc space. Once the images were safely on the laptop, I packed the scope up and went to bed. The condensation on the scope and mount was horrendous, but not frozen. Next came the processing. How do you choose the best of 5000 frames to process. 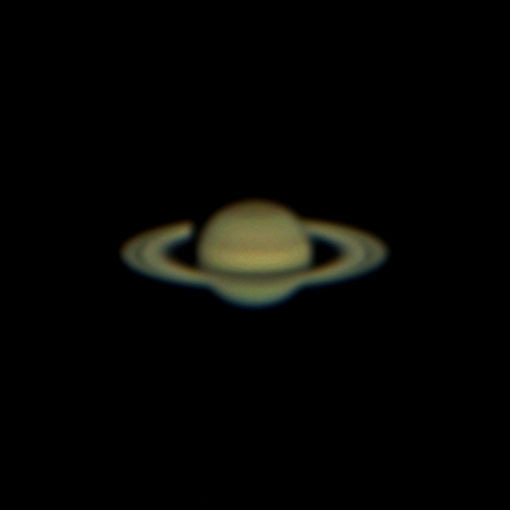 Well, I didn't go through them all, I just selected about 40 frames at time intervals throughout the event, stacked them and then ran two processes, one for the Moon, one for Saturn. These two were overlaid and merged and then the same process was done for the next set and so on. Then each of the resulting frames were overlay ed and merged to produce the final 'first process result' which is shown below. 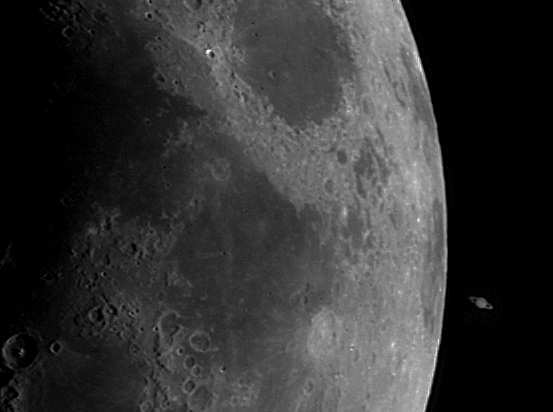 Now did Saturn move behind the moon, or did the Moon move in front of Saturn? The positions of Saturn show it in relation to the Moon at various stages. Just remember that the Moon moved, not Saturn!